De Havilland, the type of flying that our fathers and grandfathers knew, and for Clive Wilkinson the opportunity to see these historic aircraft flying again in large numbers was too good to miss. Bristling with enough weapons and electronics to literally sink a ship, New Zealand's SH-2G(NZ) Super Seasprites are fast approaching full operational status. Wings correspondent Peter Clark takes a closer look at this helicopter on a simulated missile strike sortie. Heletranz is a company that has stayed flying while watching many others come and go and Peter Clark finds out how they've done it. Radial fixed-wing aircraft are a rare species these days, and radial helicopters even rare. But in the North Island there is such an aircraft, the Sikorsky S-55B ZK-HSB. 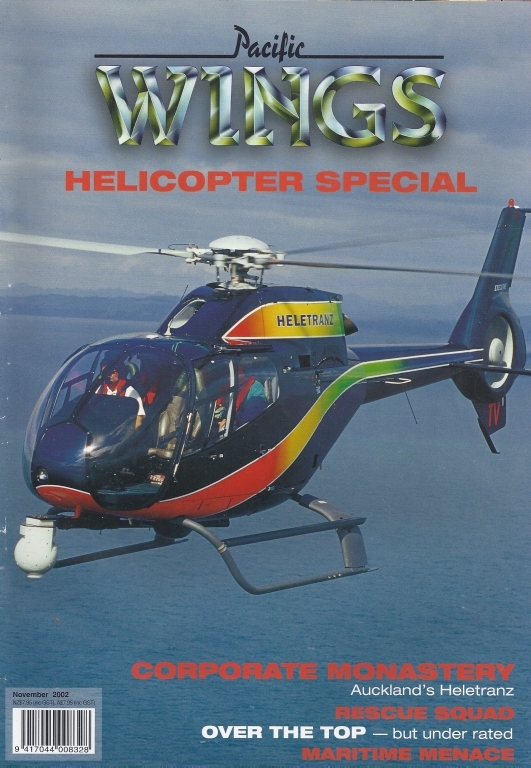 The aircraft is still earning a dollar for its masters 50 years after the type first flew and Clive Wilkinson takes a brief look at this rather interesting and unique helicopter. In a recent edition Pacific Wings uncovered a treasure trove of nose art from B-24 Liberators based in the western Pacific during 1944. A little further digging by Phil Smith revealed a snap shot of one of the biggest allied bases in this region. Louisa (Choppy) Patterson CEO, chief pilot and vision behind Over the Top - The Helicopter Company, is well known in the helicopter world with over 10,000 hours, 8,900 of which are in helicopters. But hers is a career that is as varied as they come - from Fletchers to helicopters, to Friendships and then back to helicopters again. Peter Clark talks to the pilot behind the name. From its humble one-ship-shop beginnings, Garden City Helicopters' fleet now numbers seven helicopters. Its flagship, the BK 117B1 ZK-HJC, is one of the South Island's best-known and most-beloved aerial saviours. Rob Neil went along for a ride and found out first-hand what really goes into running a rescue operation.